The Advance crutch is the first and original bi - component crutch worldwide. 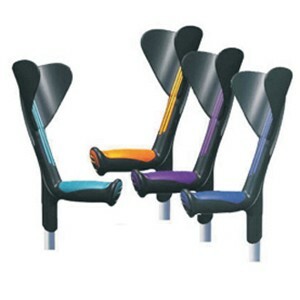 The ergonomic handle and the brachial support enhance safety and quality of arm support while moving around. Certified and tested up to 140 kg! The crutch is easily 12 times adjustable per clip. Can be equipped with various types of rubber tips. Semi - elliptical cuff which supports the ulna optimally no matter what type of clothing is worn. Soft padding on the grip and arm support moulded into the forearm assembly. The Advance crutch is the first and original bi - component crutch worldwide. The ergonomic handle and the brachial support enhance safety and quality of arm support while moving around. The crutch is easily 12 times adjustable per clip. Can be equipped with various types of rubber tips.Semi - elliptical cuff which supports the ulna optimally no matter what type of clothing is worn. Soft padding on the grip and arm support moulded into the forearm assembly.